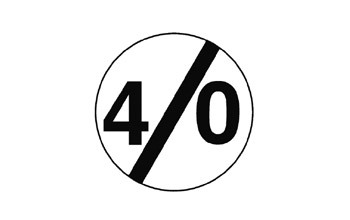 It is forbidden to exceed the speed indicated in the sign (in k.p.h). 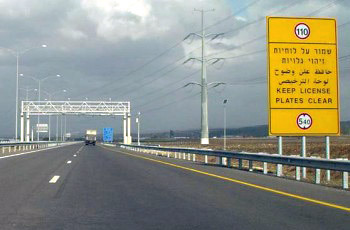 Road for motor vehicles that are permitted and capable of driving at least the speed indicated in the sign (in k.p.h). 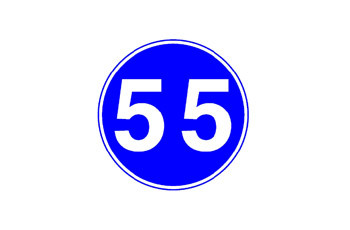 Speed limit of 55 k.p.h. 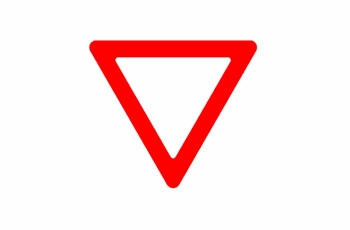 It is forbidden to drive slower than the speed indicated in the sign (in k.p.h). 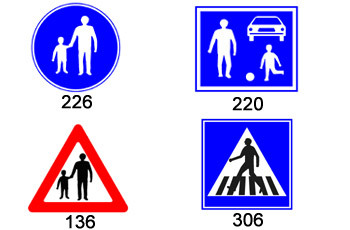 Which of the following road signs indicates a pedestrian crossing? If you see the train’s lights, stop 20 meters before the crossing. Slow down and prepare to stop before the crossing, if necessary. Drive faster and cross the railway tracks. Stop at a distance of 12 meters from the railway tracks to check if a train is approaching. 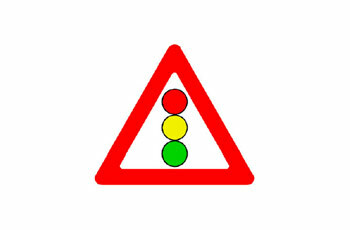 Drive faster when yellow light is displayed by the sign. Always stop before the intersection with traffic lights. Continue driving carefully and obey the traffic light. Ignore this sign, as it obligates public vehicle drivers only. Is it permitted to drive on a separation area? Yes, but only in order to cross it. No, unless otherwise marked by a traffic sign. Yes, when the separation area is paved. Careful! Local train ( or tram) crosses in both direction on the road ahead. Slow down and prepare for a possible stop if necessary, before the railway tracks. Stop 2 meters before the railway tracks and check if a train is approaching. Drive faster and quickly cross the railway tracks. If you see the train’s lights, stop 30 meters before the railway tracks. What is the meaning of the sign? Portable flashing caution sign situated before a road works. 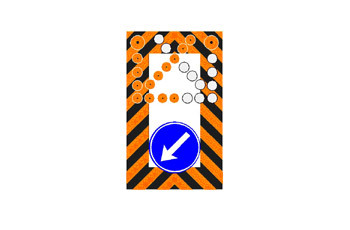 Portable flashing sign upon leaving an inter-urban road to enter a motorway (freeway). Portable flashing sign for advertising to drivers. Portable flashing sign before entering an airport. 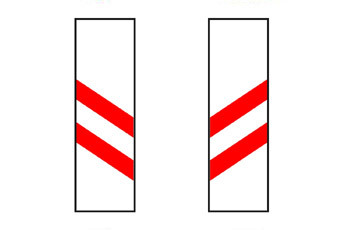 You may pass the marked place from either its right or left. Pass the place that is marked with a signpost from its right. No right or left turn. 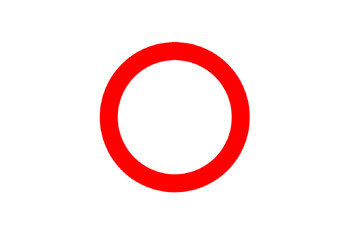 It is prohibited to drive forward. 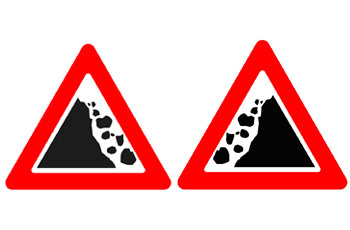 Prepare for a possible braking, deviation or stopping due to falling rocks. Dangerous descent, shift to low gear. Stop and take another (alternative) road. Drive faster to avoid falling rocks. 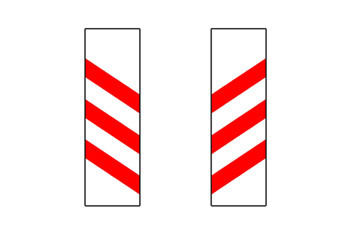 Give right-of-way to crossing vehicles. Instruction road sign: Drive right only. Is the message conveyed in the following yellow traffic sign considered legal? The sign is not a traffic sign; hence the message is not legal. The message in the traffic sign is limited to an urban road only. The yellow sign is an advertisement sign of a party having interest. The traffic sign is legal for all matters. 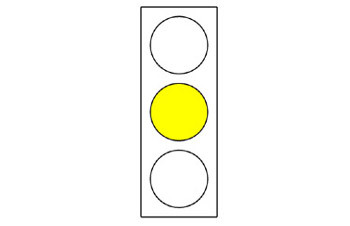 What is the meaning of the light appearing in the following traffic light (non-flashing yellow)? Continue driving, because the light is about to change to green. Stop before the intersection, unless you cannot stop safely. Continue driving, because the traffic light is about to turn green. You are permitted to drive straight, right and left. 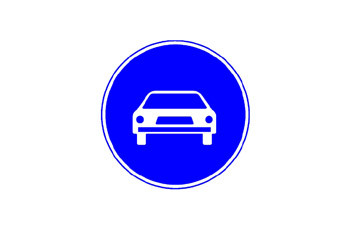 Is a taxi permitted to stop and load or unload passengers within the limits of the following traffic sign? Yes, but on an urban road only, and provided that no traffic disturbance is caused. No, except during the night. Yes, when a “bus station” sign is placed. At least 10 meters before the junction. Where you can see the traffic crossing your path. In any case – before the pedestrian crossing. 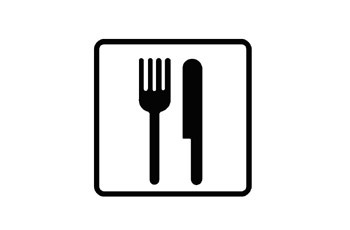 The following traffic sign is the only sign posted at an intersection. Is it permitted to turn left? Yes, only during the day. Yes, only in the intersection. Yes, in an intersection with traffic lights. 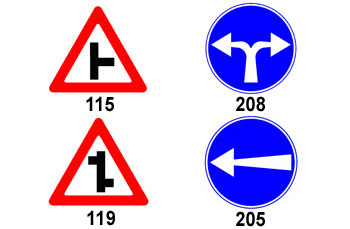 After which of the following road signs is it prohibited to overtake (for a distance of about 100 meters)? 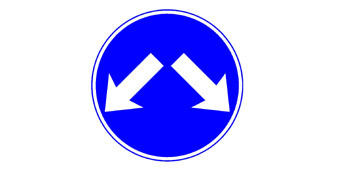 Give right-of-way to the traffic that crosses ahead. 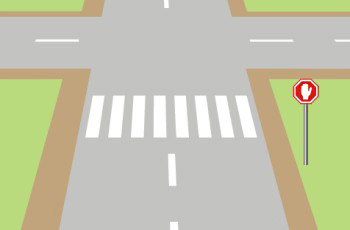 Give right-of-way to any vehicles that approaches the intersection. Stop and give right-of-way to approaching vehicles from your opposite direction. Road closed in both directions for all vehicles. No entry for motor vehicles (one-way street ahead). No entry for non-motor vehicles (one-way street ahead). No entry to the lane beneath the sign. 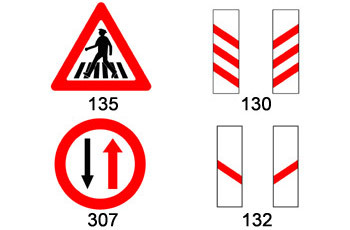 What are you required to do according to the following traffic signs? Turn leftt. Turn after the sign. Drive left. Turn after the sign. A yellow arrow shows the direction of driving for restricted vehicles only. Drive left. Turn after the sign.. A yellow arrow shows the direction of driving for private passenger cars only. Drive right. Turn before the sign. 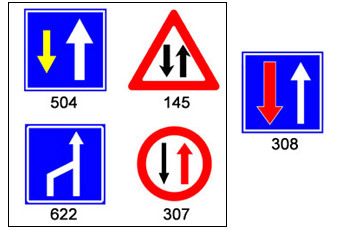 When traffic sign 308 is placed at an entry to a section,of the road which traffic sign should be placed in the opposite side of that section? 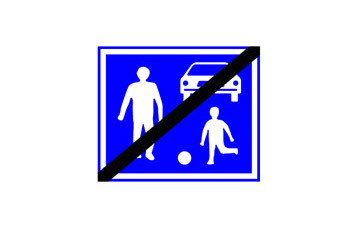 An area in which children are allowed to play when accompanied by an adult only. Speed limit beyond this point is 30 k.p.h. Are cyclists permitted to enter a road, when the following traffic sign is placed at the entrance to the road? Yes, in an urban road only. 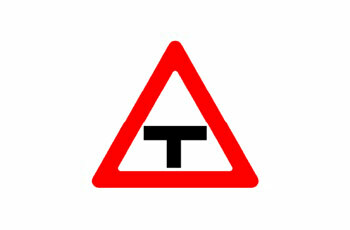 Is a “restricted vehicle” permitted to use a road in which the following traffic sign is placed? Yes, driving at a minimum speed of 55 k.p.h. Yes, driving at a maximum speed of 55 k.p.h. Yes, on a freeway only. Give right-of-way in a narrow road. Continue driving normally. You have right-of-way over opposing traffic. Give a left signal and carefully cross to the left lane while glancing in the mirrors. Slow down, keep to the right, and stay alert for oncoming traffic. 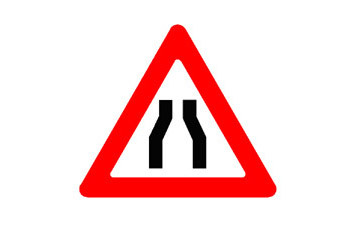 What is the meaning of the following road sign? 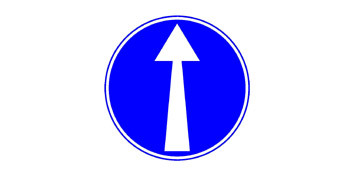 It is a direction sign to destinations on a freeway (motorway). It is a warning sign on leaving a freeway. It is a direction to destinations on an urban road. 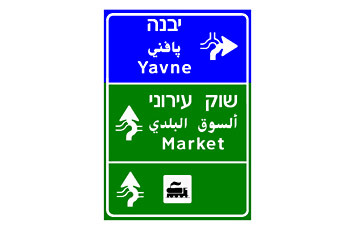 It is a direction sign before an interchange on an inter-urban road. You have reached a section where fast vehicles should drive on the right lane and slow vehicles should drive on the left lane. You have reached the end of a special speed section. You have reached a section where parking is permitted on both sides of the road. You have reached a section where speed limit is temporarily changed from 50 k.p.h to 30 k.p.h. 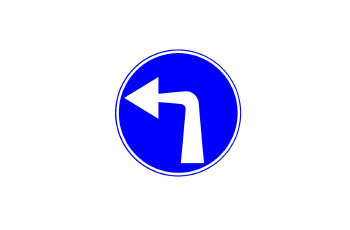 Are you required to give right-of-way when the following road sign is placed? Yes, when the following road sign is placed in an intersection, right-of-way is given to vehicles that continue driving straight. 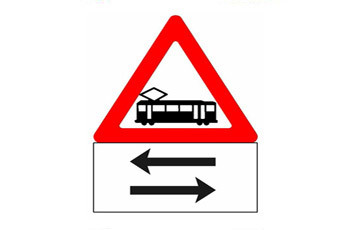 No, when the following road sign is placed in an intersection, right-of-way is given to public vehicles only. No, you should only give right-of-way according to the lawful right-of-way rules or to the traffic signs that are placed in the intersection. Yes, when the following road sign is placed in an intersection, right-of-way is given to vehicles that come from the right only.